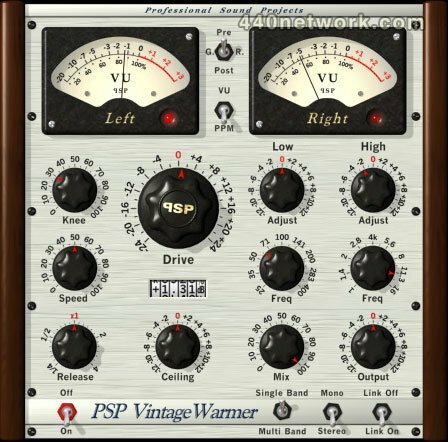 PSP VintageWarmer is a high-quality digital simulation of an analog-style, a single or multi band compressor/limiter. It combines warm analog sound with a straightforward user interface, and comes with a rich library of presets. The plug-in processor is highly flexible and can be used for both single and multi-band compression, as well as brick-wall limiting. This makes it an essential tool for mixing and mastering engineers. Careful attention has been paid to PSP Vintage Warmer's overload characteristics with the processor being capable of generating saturation effects typical of analog tape recorders. PSP Vintage Warmer also incorporates professional VU and PPM metering together with accurate overload indicators thereby assuring professional quality results. Added VU, PPM and Overs preferences reset buttons. Added ‚Äò?‚Äô on a preset bar to open an operation manual. Synchronised LED reset in PSP VintageWarmer and PSP VintageWarmer2. Preference parameters now automatically distributed across all running Warmers. Updated scroll response of all controls. Updated default values of preference‚Äôs parameters. Improper knobs‚Äô position in reference to its value - fixed. Zipper of Drive, Mix and Output knobs - fixed. Zipper of Low and High level knobs - fixed. Jumping meters when adjusting filters - fixed. * New member of the PSP Warmer family: PSP MicroWarmer which provides the same sound quality as it's big siblings, but with a simplified single-band interface and low latency performance optimized for use on individual tracks. * PSP VintageWarmer2 now compatible with hosts running in 64-bit mode on Windows and Mac OS X! 1. Mono-Stereo switch expanded to Mono-Stereo-Left-Righ selector. Now it is possible to choose only one channel for processing. 2. Controller and automation support for ProTools users improved. 1. Latency improvement - PSP VintageWarmer has 127 samples of latency. 2. Latency improvement - PSP VintageWarmer2 has 639 samples of latency now. 3. Meters in VU mode has improved needle movement response according to VU specifications. 4. Front panel name of the PSP VintageWarmer2 was changed from PSP VintageWarmer to PSP VintageWarmer2. 5. Front panel name of the PSP VintageWarmer was changed from PSP VintageWarmer LE to PSP VintageWarmer. 1. Initial click in Logic with PSP VintageWarmer2 - solved. 2. Various weird GUI behavior and crashes caused by the PSP VintageWarmer2 - solved. 3. Channel lockup and noises with PSP VintageWarmer2 - solved. 4. Gain Reduction meter shows improper values when Ceiling not at 0dB - solved. 5. Various weird meter behavior and synchronization problems - solved. 1. Due to channel routing changes we advice to check the Mono-Stereo-L-R selector state. 2. Thanks to the reduced latency we advice to check up your track synchronization. In the case of the manual latency compensation please reset your delays to adequate values. 3. The Meter delay knob on the rear panel is not present in this version. 4. Tow VU/PPM and Scale range parameters have new - more adequate names now. MeterScale changed to MeterType (VU/PPM) and MeterRange changed to MeterScale. 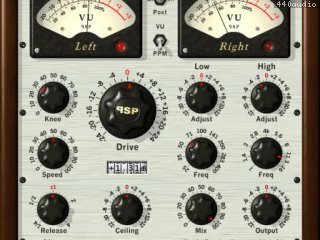 VintageWarmer 2 is a fantastic single- and multiband compressor. For mixing and mastering I totally rely on PSP's VW2, Neon and MasterComp plugs. They're really amazing, all of them. Go and try for yourself!